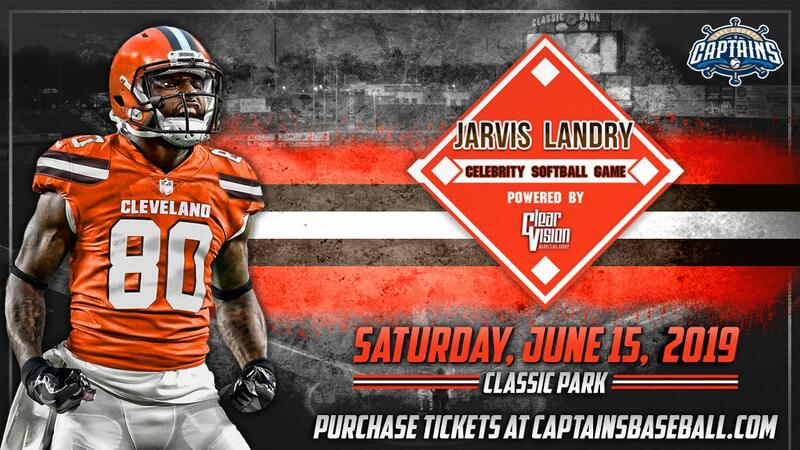 EASTLAKE, OH - Clear Vision Marketing Group and the Lake County Captains are proud to announce the Inaugural Jarvis Landry & Friends Celebrity Softball Game which will take place at Classic Park in Eastlake, Ohio on Saturday, June 15. The event will feature a pre-game Home Run Derby followed by the Celebrity Softball Game. Gates will open for the event at 3 PM with the Home Run Derby scheduled for 4 PM and the Softball Game scheduled for 5 PM. Tickets will go on sale beginning at 9 AM Wednesday, March 27 and may be purchased in person at the Classic Park Box Office, over the phone by calling 440-954-WINS (9467) or online at captainsbaseball.com or jarvislandrysoftball.com. Tickets for the event range from $20 to $47. A very limited number of Premium Box Seats in rows A and B will be available for $47 each. Lower Box Seats in rows C and D will be $37 each and remaining box seats will be only $27 each. Bleacher tickets are also available for $20 each. Parking passes for the Classic Park Gold Lot will be available for $15 per spot. Demand for tickets is expected to be high and due to the limited amount of Premium Box and Lower Box Seats, fans are encouraged to purchase tickets early. Since his arrival in Cleveland, Jarvis has been overwhelmed by the support of fans across the state and is extremely excited about putting on this game for the fans. Jarvis said, "The passion of football fans in northeast Ohio is unbelievable. Being able to host a memorable event for our fans, like this softball game, is a chance to bring everyone together this June in anticipation of a big season this fall. I can't wait to see the Orange and Brown pack the stands at Classic Park on June 15th and I promise that this event will be full of fun and surprises!" Jarvis Landry has extended invitations to many current and former professional athletes and other participants will be announced as they are confirmed. The Captains partnered with Clear Vision Marketing Group in 2015 for the Joe Haden and Friends Celebrity Softball Game which featured the likes of Joe Haden, Deion Sanders, Larry Fitzgerald, A.J. Green, and Richard Sherman just to name a few. The Home Run Derby will feature Jarvis Landry and select celebrity participants along with a handful of professional softball players. The seven-inning Celebrity Softball Game is designed as an interactive experience between the players and fans in attendance and will feature various in-game promotions and giveaways as well as opportunities for select fans to walk away with autographs.